A shy boy of Iranian descent, Farrokh Bulsara was schooled in India and moved with his parents and sister to London in the 1960s to escape a revolution in his birthplace island of Zanzibar. 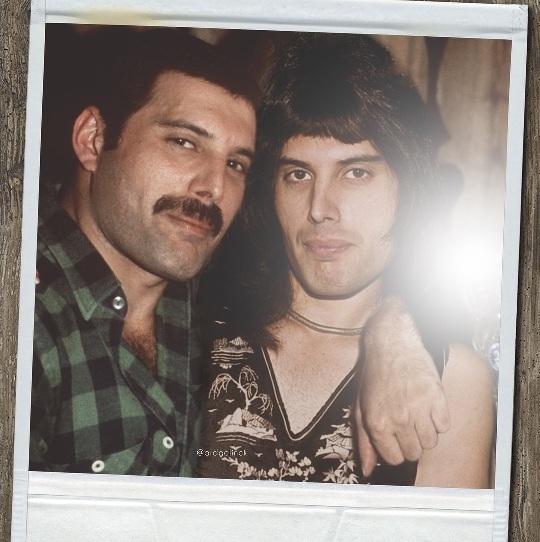 A 39 year old Freddie on the left is seen putting his arm around his younger self from just 11 years earlier; the time his band Queen were making their breakthrough with hits such as Killer Queen and Bohemian Rhapsody. His tragic death from AIDS in 1991 cut short the life of a man of huge musical talent and truly one of the greatest singers, songwriters and entertainers of the 20th century.